Following his graduation, Mr. Jacques was named Director of the Cabinet of the CEO at the Paris Chamber of Commerce, overseeing 2,500 employees. In 1992, in fulfillment of his military obligation, Mr. Jacques resigned from his cabinet post and served as a civil soldier in Mexico, where he helped French companies settle into the region. Upon completion of his military obligation in 1993, Mr. Jacques returned to France, resuming his legal career as a junior partner at a Paris law firm. By 1995, at the age of 27, Mr. Jacques established his own practice in Paris, and was later named Of Counsel for a U.S. firm based in Paris's Avenue Montaigne. 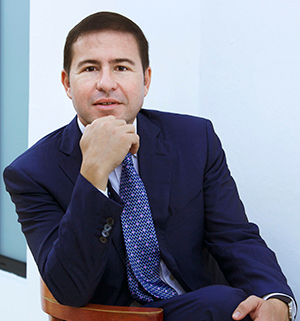 Recognizing that every action has the potential for global financial repercussions, Mr. Jacques is one of a select few attorneys who is well versed in International Finance, International Relations, and Management. Indeed, Mr. Jacques studied Management at the HEC Paris, the highest-ranked business school in Europe; received his diploma in International Relations and Diplomacy at CEDS; and earned his Master's degree in Corporate Finance. It is this unique combination of legal practice and corporate financial knowledge that has distinguished Mr. Jacques as a truly exceptional talent in international legal advocacy. Recognizing the importance of continuing education as an attorney and business advisor to his firm's clients, Mr. Jacques is a graduate of training programs in "Negotiation" and "Leading Service Firms" from Harvard Law School, 1991 and 2018 respectively, as well as "Strategic and Economic Intelligence" from the Institut des Hautes Etudes de la Défense Nationale, Paris in 2006. For more than 20 years, the Emmanuel Jacques Almosnino law firm has effectively performed negotiations, structuring, and financing of a wide range of high value assets. The firm's client portfolios include VIPs from the United States, Brazil, and Russia. The firm has successfully negotiated the purchase of properties valued at $60 million; represented American private equity companies in transactions involving five-star hotels in Saint Barths; and successfully handled the negotiation of financing up to $40 million, of commercial leases in the most famous areas of Paris and the acquisition of luxury real estate not only in Saint Barths, but also in Paris and another famous locations of France.